What is your life worth? Imagine a future in which those who are pro-life and those who are pro-choice have fought a second civil war over the sanctity of life. They end the war by compromising on a “Bill of Life” that states all pregnancies must come to term; however, parents and guardians have the right when their child is between the ages of thirteen and eighteen to abort them. The child does not die though. Each and every part of the child is kept alive; thus they are technically still alive, just in separate pieces. 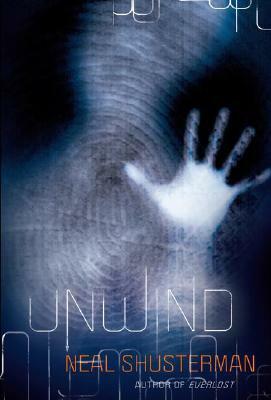 This process is known as “unwinding.” Once the unwind order is signed, no changes can be made; even if the parent changes their mind, it is irreversible. Connor discovers his own unwinding order after investigating tickets he finds, tickets to the Bahamas for everyone in his family, except for him. Connor is a good teen, but like many teens, his emotions can get the better of him and his parents have a hard time controlling him. Risa is a ward of the state of Ohio and the orphanage is overcrowded. She tries to convince the headmaster of her worth, but bungles her chance when she makes five mistakes at her piano recital. Lev rejoices in his destiny at a party solely dedicated to celebrating him and his life. Lev’s family is extremely devoted to their religion; Lev, as the tenth child in his family, is destined to be a human tithe, a human sacrifice. Lev enjoys the attention this brings and is happy to fulfill his destiny. These three teenagers meet when Connor decides to go AWOL and escape his unwinding order. The book develops through their, and others, alternating viewpoints of what happens to a teenager once the order is signed. Connor, Risa, and Lev’s journey to their future follows their growing recognition of what their life means to them. Shusterman teases the reader with just enough information to keep going, but continues to build this disturbing view of the future as the storyline develops. Mysterious references to clappers and storked babies are explained more fully later in the book and these people round out the unsettling forces at work in this troubled society. This very thought-provoking book would not leave my mind for days, or truthfully weeks, after reading it. This book has made the rounds of the youth services division and one of my co-workers still gives me grief over the books weeks after reading it. Not for the faint-hearted, especially as the reader learns more about the unwinding process, this disturbing novel will pluck at your mind and have you wondering what your life is worth.